Performance Length: 3 x 25 minute sets in a 2 hour period. 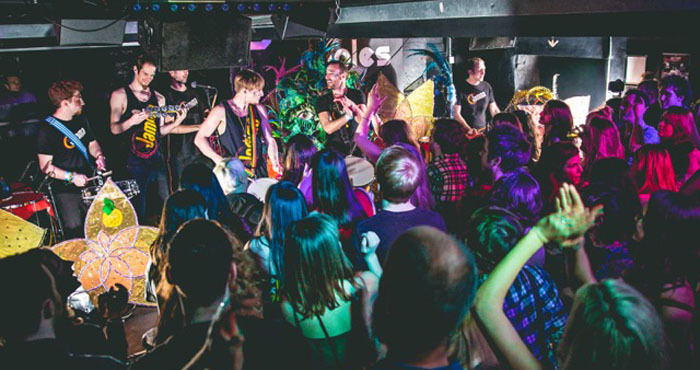 Jamma De Samba brings a Brazilian beach-party straight from Rio de Janeiro to the UK. Delivering a spectacular, up-tempo presentation, this six-piece Samba mini-troupe is the perfect sunshine accompaniment to a celebration party, whether a wedding, a birthday or a corporate event. 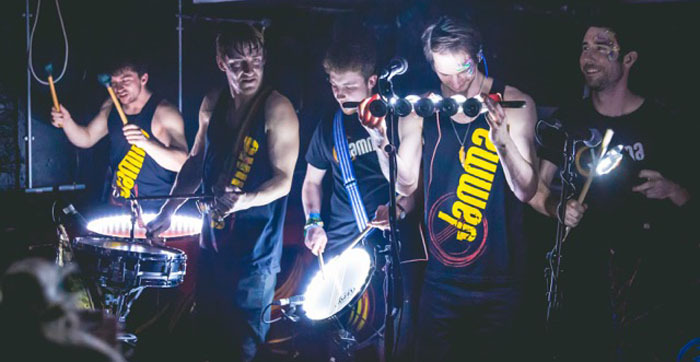 Jamma De Samba generate infectious beats and tempos that you can’t help but dance to. You can expect to see absolutely everyone within the immediate vicinity to be up on their feet dancing in no time! A larger Carnival Band is available for processions and large outdoor events. Ring or email for a bespoke price. With their professional setup and engaging performance style, the group is ideally suited for Latin-American or Caribbean-themed events. In addition, principal drummers from Jamma De Samba can organise corporate and school workshops, giving your guests the chance for hands-on involvement. 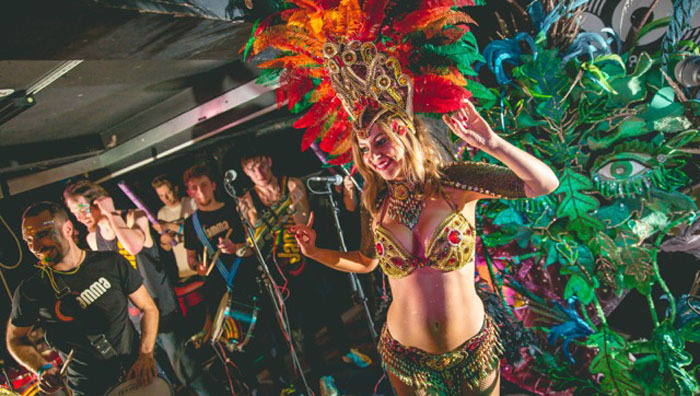 Jamma De Samba will bring the authentic sound and spirit of the Rio Carnival to any party or social occasion – private or public, large or small! 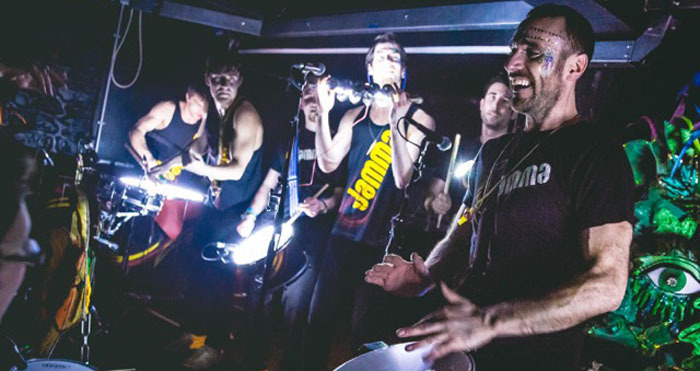 Jamma De Samba perform an exciting and vibrant fusion of traditional samba rhythms combined with popular modern funk and hip-hop beats. Wow! What a great band! I just couldn’t stop moving, it was great. Everyone enjoyed it including my husband. (He was the bar man in the bowler hat!) I would like to extend my own personal thanks as well as a big thank you to everyone for putting on such a great show despite the weather. 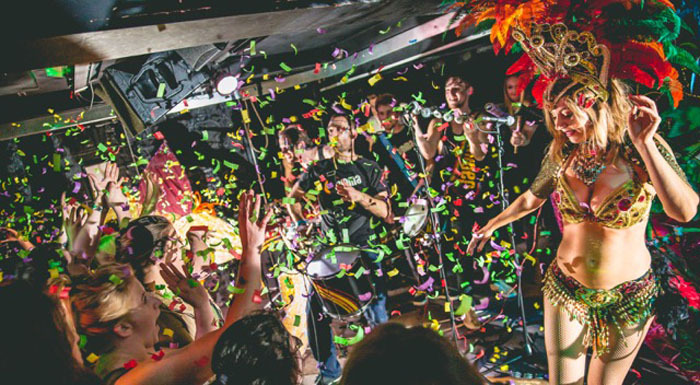 Here’s every good wish for Jamma de Samba’s continued success – with not too many wet performances! The corporate event at Park Plaza Victoria London went fantastically! Jamma de Samba provided an incredible high energy performance and I’ve passed on their details to my manager who I’m sure will be using them again. I just wanted to say thank you for working so well with the children, you really ignited their interest in Samba drumming. All of the children enjoyed it and their teachers commented on how well you worked with the students, even with the challenging pupils. Thank you so much for the great workshop you ran for us, we all enjoyed it so much. Your teaching was inspirational and we had so much fun! You gave us so much confidence and made us feel good about our ability to play well as a band. There were a lot of our members who had not played before with you and you made such a great impression on them. It worked really well and we gained so much! Thanks for bringing out the best in us! Great performance, and the workshop was a real highlight of the whole day – no one has stopped talking about it ever since! You did brilliantly getting so many people involved and we were really impressed with your energy, enthusiasm and professionalism. Amazing array of drums and percussion as well.